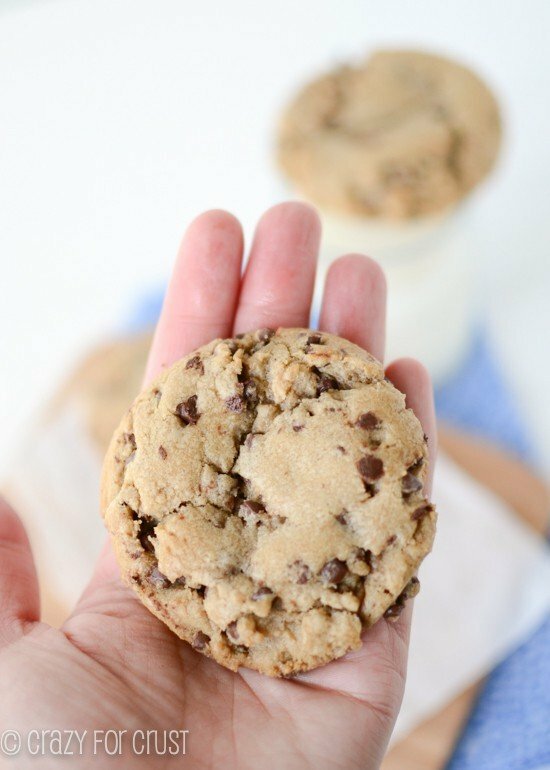 DoubleTree chocolate chip cookies are amazing, but this chocolate chip cookie recipe is even BETTER than the DoubleTree Chocolate Chip Cookies recipe!! It’s gooey and full of chocolate, oats, and walnuts. Plus, these are HUGE cookies! Did you know that when you stay at a DoubleTree hotel, they give you warm (ginormous) chocolate chip cookies at check-in? I know this, of course, because I’ve stayed at DoubleTree many times over the course of my life. But the funny thing is, I forget EVERY TIME. So when I’m checking in and they hand me warm cookies, it’s like a sweet surprise. I’m not sure if they have a mix that they distribute to each hotel or if the hotel chef bakes up a new batch every day, but there’s a warming drawer at the front desk so you’re assured nice warm and gooey cookies along with your room key. A few weeks ago, we stayed at the DoubleTree Santa Monica, and I was surprised yet again when they handed us cookies. You’d think I’d remember that from visit to visit, but I don’t, haha! Anyway, I jumped for joy like a kid and couldn’t wait to savor every bite. 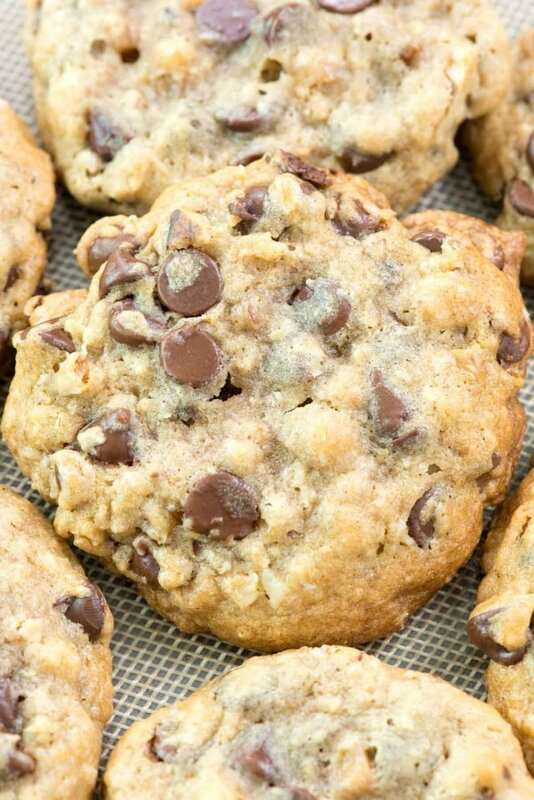 A DoubleTree chocolate chip cookie is warm and melty, gooey, with a hint oats that you can see in the dough. They’re not oatmeal cookies at all, so as you’re eating them you wonder about the oats. (Or maybe that’s just me?) All I know is that when I finish my cookie I want MORE. Better than DoubleTree Chocolate Chip Cookies? YOU BET! I have really high standards when it comes to chocolate chip cookies. I love them a lot, and over the years I’ve become a cookie snob. Cookies that are bland, dry, over baked, or crunchy do NOT satisfy my chocolate chip cookie craving. My perfect chocolate chip cookie is just a tad under-baked so it’s gooey, with melty chocolate, nuts are a bonus, and they need to be bursting with flavors. Basically, I want fireworks in my mouth when I eat a chocolate chip cookie…otherwise it’s not worth the calories. The DoubleTree chocolate chip cookies come within a few percent of my idea of a perfect chocolate chip cookie, which is why when I made this copycat version I had to make them BETTER than the DoubleTree Chocolate Chip Cookie. And they are. BETTER, that is. I just made a few tiny changes to the original recipe and the result? My absolute favorite cookie. 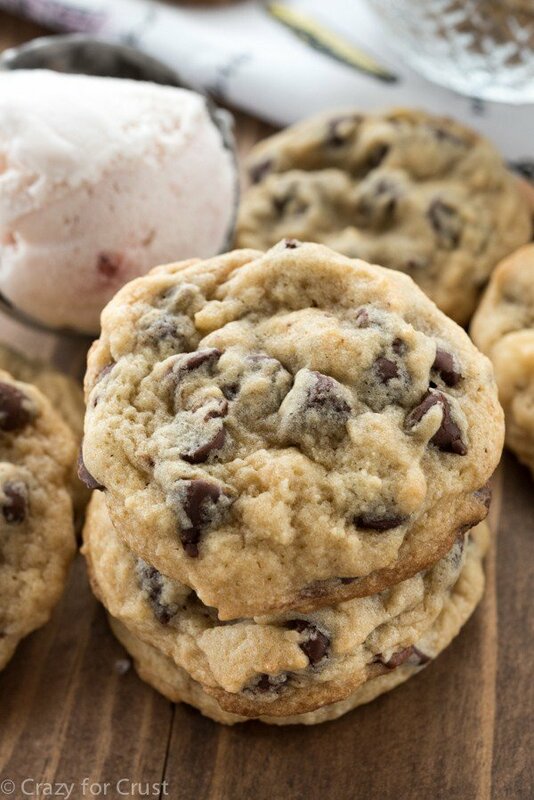 I will never again make any other chocolate chip cookie…unless I’m making these. Oh, or these. I start with melted butter. I always start with melted butter for my chocolate chip cookie recipes. I love the caramelized, toffee-like flavor it gives to the cookies, especially when paired with gobs of brown sugar. The recipe calls for ground oats, which I used. The oats give a bit of flavor and texture, and help bind the cookies. Don’t leave them out; these aren’t oatmeal cookies at all, but the oats give them the ultimate flavor. TONS of chocolate. These cookies have 3 cups of chocolate chips!! I used regular chocolate chips, but you can use minis for an even richer cookie. UNDER-BAKE them. They’re done just when the top looks done and not a minute later. They’ll still be gooey in the center. 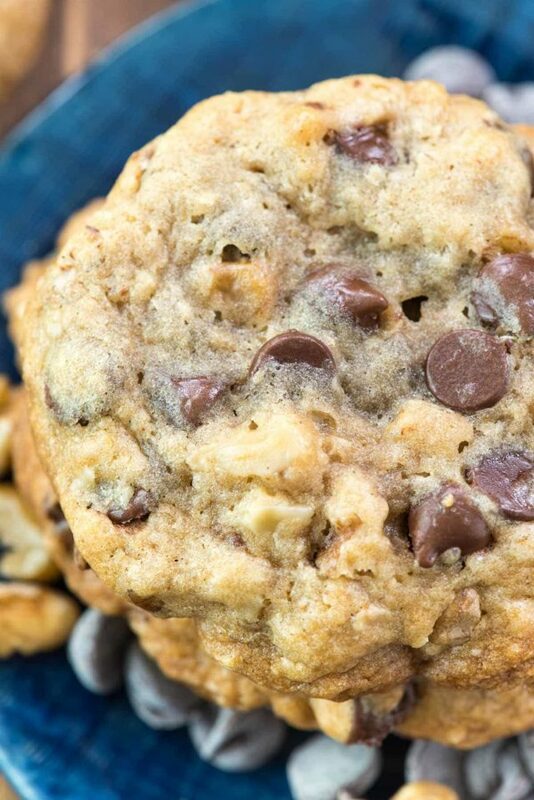 THAT’S the solution to the best chocolate chip cookie problem: THE GOOEY CENTER. SIZE. I was going for a huge cookie, so I used 1/4 cup of dough each. But you could make these less insanely huge by using a smaller cookie scoop. Still chill them, but they’ll bake up quicker. Good luck just eating one. That’s the one plus of the hotel: you only get one (or two). These? You get more than a dozen! This chocolate chip cookie recipe is even BETTER than the Doubletree Chocolate Chip Cookie recipe!! It's gooey and full of chocolate, oats, and walnuts. Plus, they're HUGE! Stir together melted butter, brown sugar, and granulated sugar until smooth. (No mixer needed - just use a wooden spoon or spatula!) Stir in vanilla, lemon juice, and eggs. Stir until smooth, then stir in flour mixture. Mixture may be slightly lumpy because of the ground oats. Stir in chocolate chips and walnuts. Bake for 13-17 minutes. Do not over bake - these are best a bit under done. 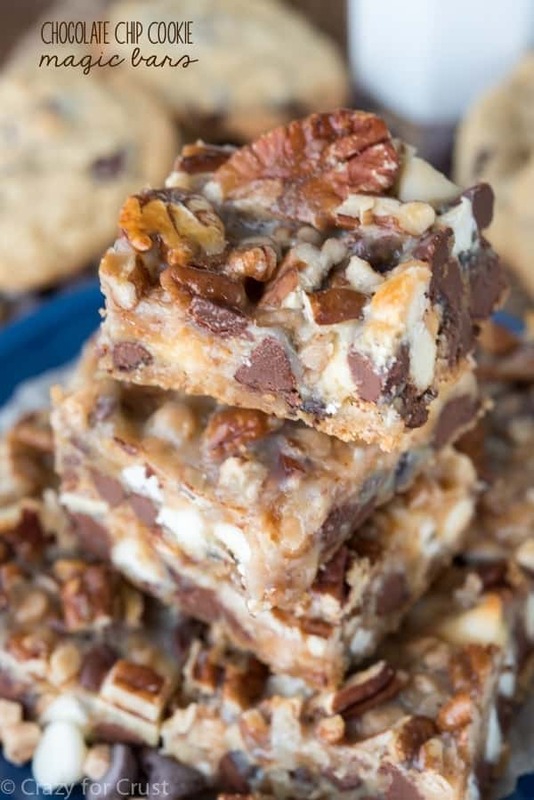 Want to try some other copycat desserts? My friends have some awesome copycat recipes! McDonald’s Cherry Pie Copycat Recipe, from Amanda’s Cookin’. Copycat Krispy Kreme Doughnuts Recipe, from Brown Eyed Baker. Copycat Starbucks Double Chocolate Brownies, from A Dash of Sanity. Nut allergy. Can they be made without the walnuts or is something additional required to make up the space ? Hotels normally have a food distribution company make up the batter and then distribute them all ready to go into the little toaster oven that they provide as well. The people of the front desk usually make them as needed. These are AMAZING!! You have to follow the directions without changing anything even letting them sit in fridge before baking. SO GOOD!! Just finished baking these cookies. They were delicious. Hubby has eaten several and rated them a 10. I have to admit that I didn’t see the part about chilling them until I was filing the recipe away so I can make them again. Definitely a keeper recipe. By the way, I used a combination of chocolate chips and chocolate chunks. Thought I rated the recipe but guess I didn’t. How did your cookies turn out since you didn’t get a chance to chill them? Did they turn out good still? That scoop you used in the video doesn’t look like a 1/4 cup measure. Hi could you please give the ingredients in metric weight? I always use a scale for baking but really wanna try this recipe! One of the best chocolate chip cookie recipes I’ve ever made. Wow, I am impressed. Best recipe I have tried for choc chip cookies. My boyfriend said these are his favorite cookies so far! I made these with pecans instead of walnuts and froze them for 2 hours instead of refrigerating for 4. I cut down to 2 Cups of chocolate chips, because the 1st cup looked like plenty and the 2nd still felt like overkill. The batch made 15 largeish cookies for me. They all came out great and thick unlike some of the reviews saying they were flat. If I make these again I will bake them a little longer as I’m not a huge fan of the undercooked middles. I’d like to make them with my cookie scoop instead of the ¼ cup .. how does that change that baking time or temp? I made them as ¼ the first time with out refrigerating them as I’m an impatient fool but the were still amazing just to big and and rather have more cookies than big cookies personally .